What makes you happy? This answer varies for every individual, based on their unique lifestyle choices and personal preferences. In honor of the holiday season, we are currently running a contest for those living with Multiple Sclerosis who decide to make the most of each and every day. Through our photo contest, fans and supporters of MS - Living Symptom Free can show us what makes them happy on a daily basis! The “What Makes You Happy?” contest is a fun way to share your happiness with us, and hold those things close into the New Year. First things first, to enter you must “Like” the MS – Living Symptom Free Facebook Page. 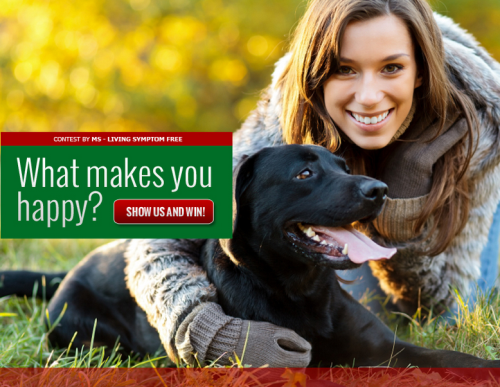 Next, simply submit a photo of someone or something that makes you happy to our “What Makes You Happy?” Contest. Some examples of the types of photos you can upload include: your spouse, pet, sentimental object, or even a hobby of yours. Users can also submit existing photos from their computer or Facebook and Instagram accounts. After your photo is uploaded, encourage your friends and family to participate by voting for your photo! Once your photo is uploaded, fans of the MS – Living Symptom Free Facebook Page will vote for their favorite photos. The top 5 photos that acquire the highest number of votes will advance to the final round. In the final round, MS – Living Symptom Free will select one winner of the “What Makes You Happy?” contest. The lucky winner will receive a gift basket filled with vitamins, supplements, organic products, gluten-free foods, and a signed copy of the MS – Living Symptom Free book! Contest ends on January 4th, 2013 and our winner will be announced on January 9th, 2013! This promotion is in no way sponsored, endorsed or administered by, or associated with Facebook. Only one (1) entry per person per household. MS Living Symptom Free holds the right to exclude participants submitting content that is considered: spam, defamation, crude, or inappropriate. Sponsor holds the rights to extend contest duration.There are no cash redemptions or prize substitutions, except that Sponsor may substitute a prize of equal or greater value for any prize noted above. Sponsor will not replace any lost or stolen prize. We take your privacy very seriously and do not, under any circumstances, make information available to other parties. Information collected through this promotion will not be made available to or used by any entity other than the MS Living Symptom Free, for any purpose other than prize fulfillment. Recipients must be at least 18 years old and reside in the United States to participate. No purchase necessary. What makes me happy is the love that surrounds me every moment of my being. I am s blessed woman to have Christian parents who taught me long ago that material things can be replaced. The love and companionship of family and friends cannot. For this I am truly thankful , that is why my life is happy. My children is what make happy even though I have this disease for the rest of my life until a cure is found watching them grow until beautiful adults and me being for them makes me happy every day. My husband makes me happy for being their every step for the way and continues to be my hero.I am looking forward of many years of happiness together.The happiness in my heart for my family is important to me that is why happiness is better shown then express by words. Happiness is just a state of mind, but I'm areone who controls it. Like a car, if I see my mind heading in the wrong direction, I can steer it the other way. I love researching all about this mystery that I posses. Also, I'm a 24aholic..LOL I love NASCAR with Jeff Gordon as my favorite driver to watch.